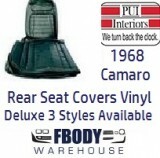 Below is our full selection of replacement seat covers and parts for your 1967 - 1969 Camaro. NOTE Shipping IS included in pricing on orders inside the USA. Use the drop down menu boxes for shipping to Canada or Worldwide. This is a replacement screw set for the sill plates on 70-81 Camaro and Trans Am. This is NEW replacement Rear Fold Down Seat Carpet for 1967-1969 Camaro or Firebird. 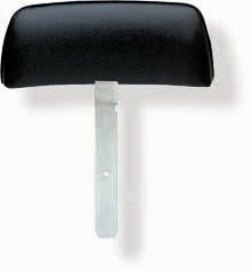 This is a set of NEW reproduction Headrest Assemblies for 1969 Camaro or Firebirds. This is a set of NEW reproduction 1969 Camaro Firebird Headrest Escutcheon/Brackets. 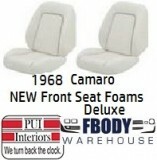 This is a set of NEW 1967 1968 1969 1970 Camaro front bucket seat back trim. Sold as a pair and available in 7 factory colors. This is a NEW 4 piece set of Chrome Seat Knobs for 1967-1970 Camaro and Firebirds. This is a set of NEW Bucket Seat Side Bracket Covers for 1967-1970 Camaro or Firebird. Origianl Style brackets for 1967-69 Camaro or Firebird requiped with a folding rear seat. 1967 - 1969 Camaro Firebird Package Tray (Standard or Deluxe Mesh) Many colors! New replacement rear speaker shelf, (Package Tray) for 1967 - 1969 Camaro Trans Am and Firebird. 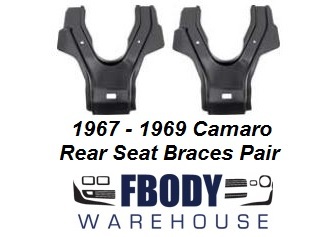 Fbodywarehouse is pleased to offer our clients new reproduction rear seat support braces for 1967-1969 models. Replace your bent, rusted, or missing originals with this brand new reproduction set by spot welding them to the rear floor board and package shelf. Braces are designed to attach the package tray to the under seat pan on coupe models only. Produced by PUI these new replacement seat foams compliment the new replacement seat covers we also offer our clients! 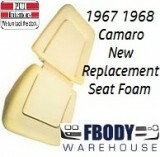 New replacement front seat foams for use on 1969 Camaro with standard interior. 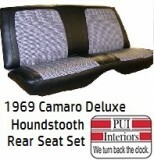 New replacement DELUXE 1967 Camaro front BENCH SEAT w/ ARMREST seat covers. 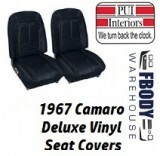 New replacement DELUXE 1967 Camaro rear STATIONARY seat covers. 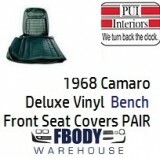 New replacement vinyl deluxe covers from PUI offer superior quality and fit for your early first generation 67 Camaro with STATIONARY REAR seats. New replacement DELUXE 1967 Camaro rear seat covers. 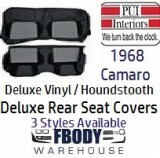 New replacement vinyl deluxe covers from PUI offer superior quality and fit for your early first generation 67 Camaro with FOLD DOWN REAR seats. New replacement DELUXE 1968 Camaro front bucket seat covers in VINYL. 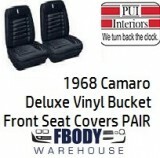 New replacement vinyl deluxe covers from PUI offer superior quality and fit for your early first generation 68 Camaro with bucket front seats. New replacement DELUXE 1968 Camaro front bench seat with armrest seat covers in VINYL. 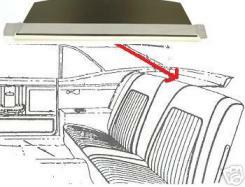 New replacement vinyl deluxe covers from PUI offer superior quality and fit for your early first generation 68 Camaro with bench front seat. 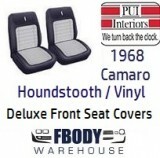 New replacement DELUXE 1968 Camaro REAR seat covers in VINYL. New replacement vinyl deluxe covers from PUI offer superior quality and fit for your early first generation 68 Camaro's rear seats. 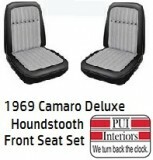 New replacement vinyl / Hounds Tooth deluxe covers from PUI offer superior quality and fit for your early first generation 68 Camaro's rear seats. New replacement front seat foams for use on 1969 Camaro with DELUXE interior. The other does not have the springed backrest and hence uses a thicker foam. New replacement front seat foams for use on 1968 Camaro with deluxeinterior. New replacement DELUXE 1969 Camaro front bucket seat covers. These are deluxe with vinyl and comfortweave pattern insert. 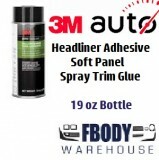 Produced by 3-M this is a spray trim adhesive and is what we use here at Fbodywarehouse on our projects. 19oz bottle provides enough to recover your headliner etc. For use on Vinyl Tops, vinyl trim interior parts such as plastics, sun visors, seats, headliners, door panels, side trim panels etc. Provides a long lasting bond onto many various surfaces and is a must have when restoring your car!